When my Mom passed on March 6, 2006, my sister took care of all the details, including clearing out my Mom’s room at the nursing home. She gave my mom’s clothes to Good Will and brought the family pictures, my mom’s glasses and our children’s drawings in a box and brought them back to me. I put them in a corner in my bedroom, and haven’t touched the box since March, when Mom passed. I just wasn’t dealing with it. Tonight, I was in my bedroom re-reading JH’s book “Born Knowing”. I got the “Quickening Chapter” where he describes his very first mediumship experience. Near the end of the chapter I put the book down and decided to finally look in the box of my mom’s things. Maybe I’d find the Ritz crackers, hehehe I think to myself. What I found was even more amazing. What I thought was a silk flower arrangment in the box was a REAL LIVE PLANT . 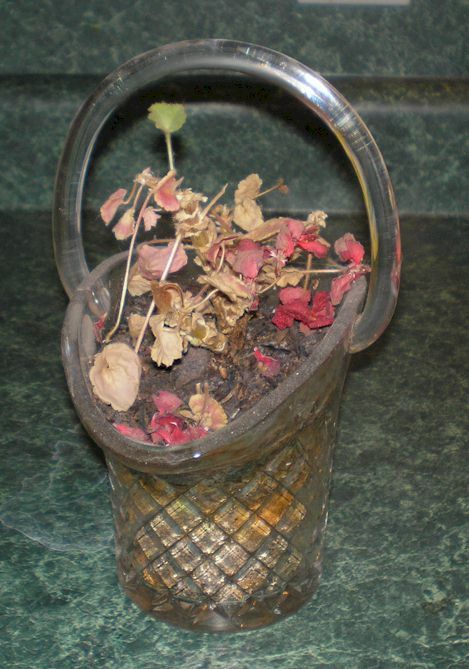 I looked at the dried up flowers laying on the crusty, dry dirt, and the obvious white dust laying on the glass planter from the last 7 months. I did it! I really did kill HER plant! John Holland was more accurate than I thought he was!!! When my sister gave me the box, I had no idea it was a live plant, I honestly thought it was fake! My jaw dropped. But that was NOTHING. Upon further investigation, my heart stopped. Look at this picture…..there is new growth — a new sprout coming out of a dead plant, that hasn’t been watered in 7 months, that has not seen sunlight in the corner of my bedroom!!!! The new sprout can only be a few days old! How can this be???? DOUBLE WHAMMY….. Please help me explain this, as I am in total shock right now…. :eek: Oh, my! I think your mom wants you to have a live plant from her! I’m not sure whether I need to offer you:coffee: or :beerhere: , but here’s some (((Hugs))) and kisses :hearts: . Breathe, Pam! :angel: That is so totally awesome! Pam!!! Yo, Pam!!! Stop staring at that plant and get yourself into the chatroom! :eek: Oh my gosh Pam!!!! You’re mama is trying to make a point in a very big way isn’t she? Look at this picture…..there is new growth — a new sprout coming out of a dead plant, that hasn’t been watered in 7 months, that has not seen sunlight in the corner of my bedroom!!!! The new sprout can only be a few days old! How can this be???? DOUBLE WHAMMY….. Please help me explain this, as I am in total shock right now…. It is so awesome that it is trying to grow now. What a blessing for Pam that she had this validation. Amazing ain’t it?? Your mom is right there with you when you were probably feeling at your lowest to show you – hey there’s new growth!! How totally awesome that she could joke with you then give you such a beautiful AFTER validation!! Are you sure it’s an African Violet? It almost looked like a begonia to me. (sp?) My own mother complains about all of her African violets dying when we moved to the UP. (too cold on the porch).